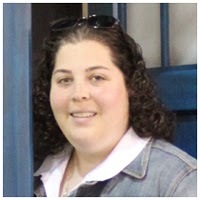 Posted at: 11/27/2010 11:53:00 AM . Credit cards can be your best friend or your worst enemy. You can easy spend more than you have, but you can also save tons of money using credit cards. The Consumerist has compiled a list of tips for smart usage of plastic. I have added to their list with a few additional tips. Pay off the balance in full each month. “In the seven years of my credit history, I have never carried a balance or paid a fee of any kind,” Tervooren says. You might not realize it, but that interest can really add up fast. 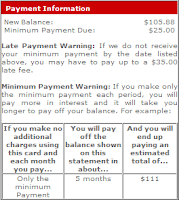 I also pay off my credit cards every month, but I wanted to show you this screenshot from my Target Redcard's website. 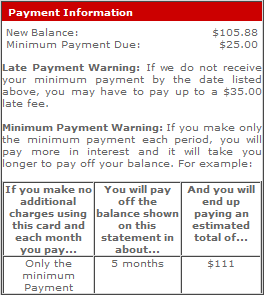 If I were to only make the minimum payment each month, I would pay more in interest than for the actual purchase. Take advantage of rewards. “I am very strategic with the cards that I apply for. I use them to build large sums of frequent flyer miles that I use to exchange for otherwise very expensive trips,” says Tervooren. Next summer, he’s flying to Africa and Europe to climb two of the world’s tallest mountains as well as run a marathon. He’s already booked his tickets—at no cost to him. It's very important to choose your cards wisely. Don't sign up for too many cards because the more in your wallet, the more likely you are to overspend. I recommend getting one or two major cards and make them different brands. For example, have a Visa and a Mastercard. Limit the number of store cards you have. If you sign up for store credit, make sure it's a store that really gives you a benefit for using their cards. Target gives card holders 5% off every purchase, Macys often gives card holders an additional 15% and Kohls is known for their 15-30% discounts. Having too many cards in your wallet will just encourage you to overspend. Pay attention to interest rates. These discounts are great, but only if you stick to the rule about paying off your cards in full every month. As you can see from the Target screenshot above, interest rates can quickly cancel out the discounts offered. That is exactly what stores want when they offer you that deal. Pay attention to annual fees. Often times the cards with higher rewards also carry annual fees. Consider how much you spend during the year and the actual value of a reward. If you are paying an annual fee of $100 but only earn a single one-way airline ticket during the year, was the fee worth it? Does your employer reimburse you for required purchases and you'll easily charge enough for rewards to cover an entire vacation? That $100 fee now seems worth it. Build your credit now. By being smart with credit cards while you're young, you will find more doors opening for you in the future. When you go to make a large purchase such as a car or house, you'll find brokers will be able to offer you much better interest rates. Some car companies advertise that 0% financing but that's only for people with the perfect credit scores.